There are lots of perks to being a newspaper columnist. One of them is the crystal ball that enables us to predict the future. Every columnist has one, though we don't like to brag about it. But, when we write something like "this policy is doomed to failure..." we are not guessing. We have seen the doom. Above is a picture of me taken in 2000, in my official "Columnist's Seer Uniform." I was in the process of predicting that Al Gore would be the next President of the United States, due to his narrow win in the popular vote. As you can see, I had a goatee. I have since shaved it off, seeking to go for the youthful "with it" blogger look, ala Dan Rubin, our very own Blinq blogger, who trimmed his waist-length tresses to cater to the web audience. There's a hitch to this crystal-ball thing. Like a pirate radio station, the signal is weak, the reach is limited. I can’t see too far into the future and often there’s too much static to tell what's what. 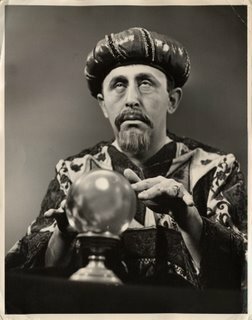 This is prelude to mentioning that sometimes I will consult my crystal ball and let you know what it tells me. It is an exclusive feature of this blog and -- warning to imitators -- I am in the process of copyrighting it. My first prediction is that John Dougherty will succeed in his lawsuit challenging the legality of city’s new campaign finance law. That’s the law that limits contributions to mayoral candidates to $2,500 per individual and $10,000 per PAC. Doc, head of the local electricians union and a wannabe candidate for mayor, is basing his challenge on state pre-emption. To translate: the state has a campaign finance law that does not limit giving, ergo Philadelphia cannot do so because it would pre-empt a state prerogative. Once the court rules in Doc’s favor, the candidates for mayor will be free to raise as much as they want from whomever they want. How do I know? My crystal ball told me so. P.S: If it turns out any prediction I make is wrong and you are the first to call me on it (via email or the comments section of this blog) I will donate $25 to your favorite charity. State pre-emption? That seems to have happened a lot to Philadelphia since Perzel became Speaker. How about I make a prediction as well? I predict that the Public, ashamed by union embarrassments with the Civic Center, COmcast Tower and the Real World house will let Doc know in the Primary that they don't want a corrput Mafia Boss as their mayor. The local ordinance doesn't address anything covered under the state election code. If the state election code is amended to address contribution limits, then the city law will be preempted. Before it can be preempted, the state legislature has to act ... not the courts. i could rent you those tresses that i cut. to anonymous's point above, it has been mentioned in the paper, but the same city solicitor who narrowly defined who the bill applied to, also said that the bill was defensible on state preemption.